This H&R and Bilstein E92 328i suspension package will give a modest improvement in handling without sacrificing ride quality. This is the perfect suspension for someone who wants a suspension more capable than the stock sport package but is turned off by the cost and complexity of coil overs. We use Bilstein HD shocks as the dampers and they feature Bilstein's patented and innovative valving system. With this system, small bumps and impacts are absorbed as they should be. But the shocks stiffen for cornering and other suspension motions. It's the best of both worlds as the shock self-adjusts based on suspension motion. 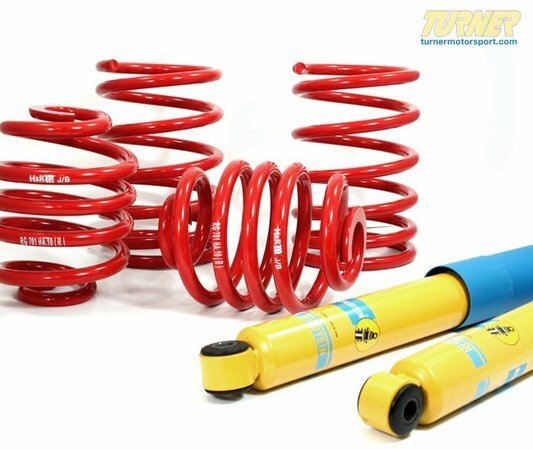 Bilstein HD shocks work with these shorter springs because the only change Bilstein makes is a slightly longer shock. These fit with the stock strut and shock mounts, making for an easy and clean install.